Sport at its best points us toward a future of play and delight. Sport is something we do, an experience that is hard to describe because it captures our whole selves. The experience draws us in and brings us back, day after day, season after season. We love to play—and yes, to win, or at least to invest enough of ourselves to have a chance. God’s world includes the myth-like space where sport resides, where we celebrate our humanness, our desire to be excellent, and our need to belong. Sport at its best points us toward a future of play and delight. And God is there with us, in every leap, backflip, tackle, spike, and slap shot. Sport can train us, educate us, change us, for better or for worse, but that is really not the point. First and foremost, sport is part of a truly abundant life for those who love to play. The meaning of sport is not primarily in its use but in its practice. Sport is something we do, something we experience. Christians know that God delights in the world—including sport. As we experience sport, we participate in that delight by honoring the game, authentically competing, and getting a taste of the freedom that Jesus Christ offers. “Sport. Faith. Life.” is part of the Calvin Shorts, a series is for global Christians who want to understand our world better. Each book examines a single topic and suggests ways to think and act faithfully. These books are great for discussion in small groups, book clubs, and even the classroom. "It isn't easy to answer the question: How does a Christian engage in sport? In Sport. Faith. Life. Brian Bolt provides guidance that is crystal clear. Drawing from deep theoretical arguments and popular examples, this book is both intellectually sound and amazingly accessible. Every Christian and every sports fan needs a copy!" 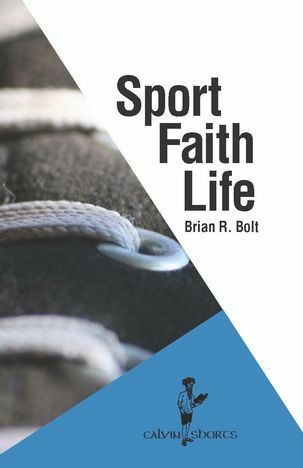 "Brian Bolt’s book captures the core of sport and the heart of Christian faith, avoiding simplistic platitudes on both sides of the conversation. Refusing to overplay or underplay the significance of sport, this book invites us to move deeper into the created goodness of our physical and competitive selves, and to be open to glimpsing parables of redemptive grace amidst the sweat, injury, exhilaration, frustration, and triumph of sport." "While Brian Bolt admits he would rather play sports than read or write about it, he has eloquently and engagingly written about the seemingly hardwired relationships between sport, faith, and life. Throughout his relevant examples and chapters, Bolt adeptly walks the tightrope of sports’ seeming contradictions and parallels with Judeo-Christian notions of good and evil, utility and perversion. Bolt leads readers through excellent insights and spot-on evaluations for anyone of faith to more profoundly consider their relationship with sport. This book is ideal for prompting public conversations and would be especially relevant for Christian book clubs and academic conversations on sport and religion—as it tasks readers to consider the role these two major cultural activities have in our lives today."